President Arif Alvi here on Monday suggested need to strengthen and turn Citizen – Police Liaison Committee (CPLC) functional in accordance to its actual spirit. During his visit to CPLC office, located on the premises of Sindh Governor House, he said the project conceived and initiated by a group of upright citizens of the country needed to retain its spirit. Taking exception that CPLC established in early 1990s has no more than seven of its offices in the province, he also sought expansion in its network in all 29 districts of Sindh. 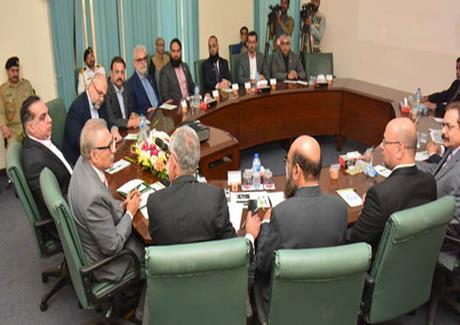 “We actually need a CPLC network across the country to help bridge lack of confidence between citizens and police,” said President Alvi reiterating need to facilitate people exposed to crimes. Accompanied by Governor of Sindh, Imran Ismail, he on the occasion was also given an extensive briefing about the public facility with a request to use his good offices in getting raised its current grant from Rs.15 million to Rs.25 million. CPLC Chief, Muhammad Zubair Habib said the case for the same has already been forwarded to the provincial government. The president was apprised about the coordination between CPLC and FIA that has significantly reduced crime ratio in the metropolis in particular context of snatching of cell phones / vehicles along with incidence of child abduction. It was mentioned that steps were being taken to further streamline this coordination and counter cyber crimes fast growing across the country. CPLC chief also discussed in detail the ongoing Neighborhood Care project and that of identifying unclaimed bodies through thumb impression.